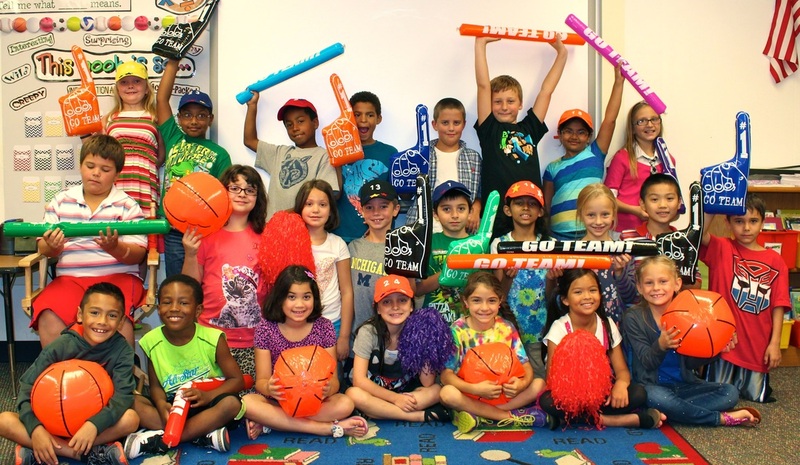 I took students' photos with a baseball cap on the first day of school. I then used Print Shop to crop their heads and place them in front of a stock image of a baseball field. You could also just take students' photos in front of a sports scene setter! 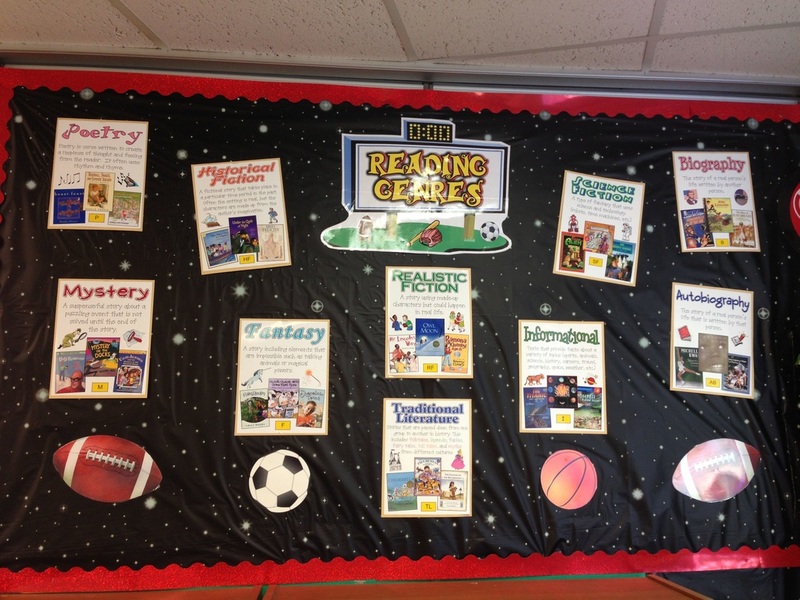 Posters are displayed in the hallway outside our classroom. I made a team version of a Sports Illustrated cover and blew it up for our hallway display. Sports balloons made the first day of school exciting for the students! 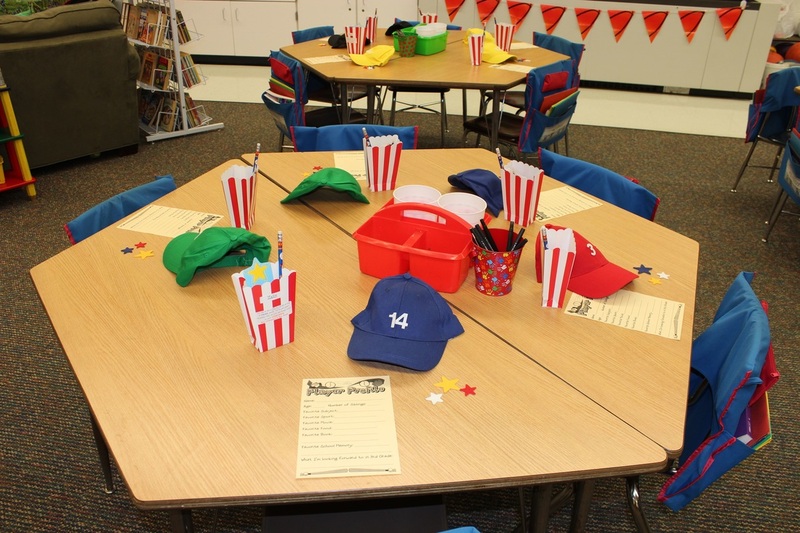 On the first day, students are given a baseball cap (from Oriental Trading) with their class number on it. They can add self-adhesive felt stars to decorate their hat. 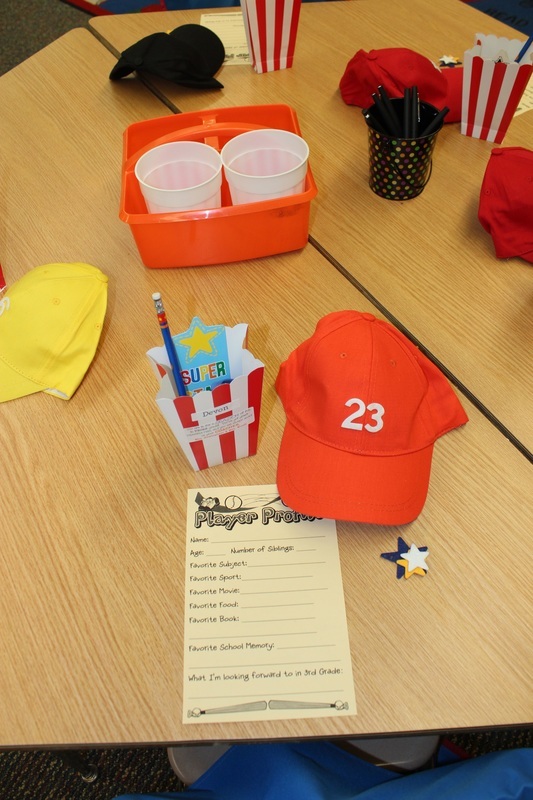 Students fill out a "Player Profile" so that their classmates can learn more about them. 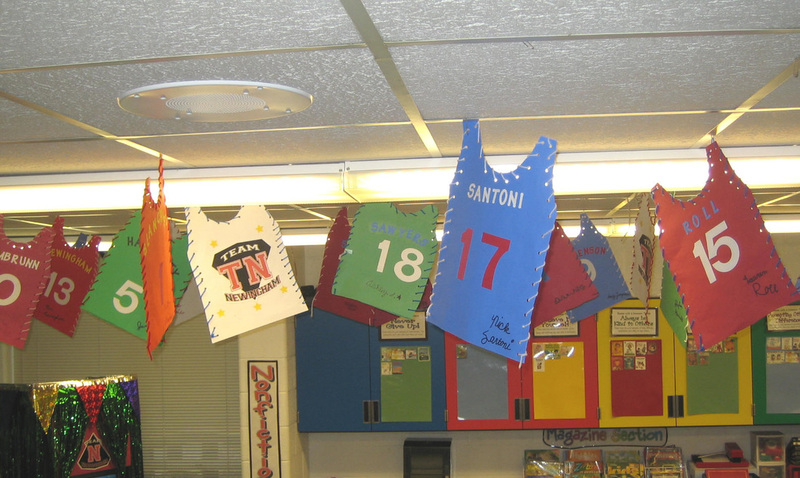 Students create their own jerseys with their last names on the back. The jerseys can be hung from the "rafters" or displayed in the hallway. If it's an Olympic year, make the jerseys red, white, and blue with medals! 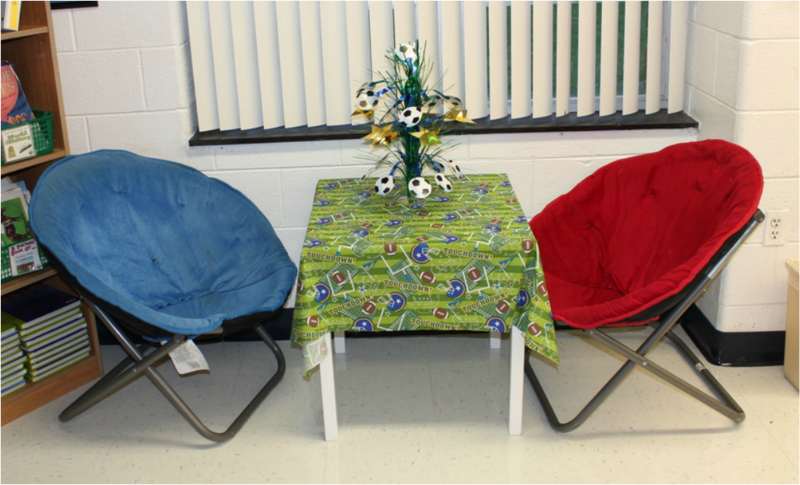 I purchased a football-themed fabric to cover the table and added a soccer centerpiece from Party City. 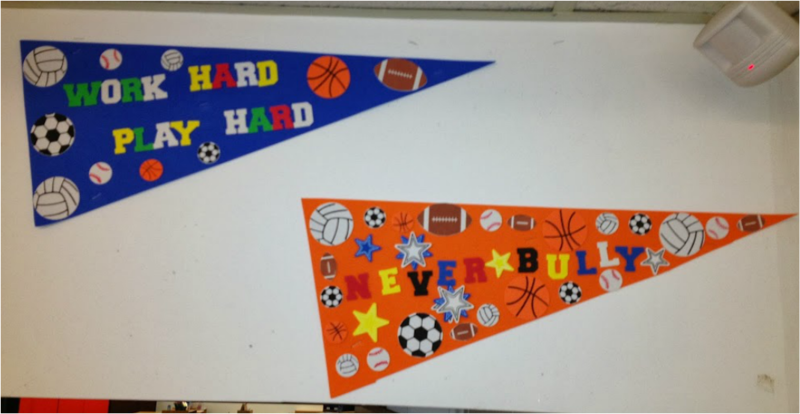 Hang pennants with positive slogans created by the students on the walls of the classroom. My teaching partner's mom took the pillows we already had in our classroom and created new covers for them using sports-themed fabrics! 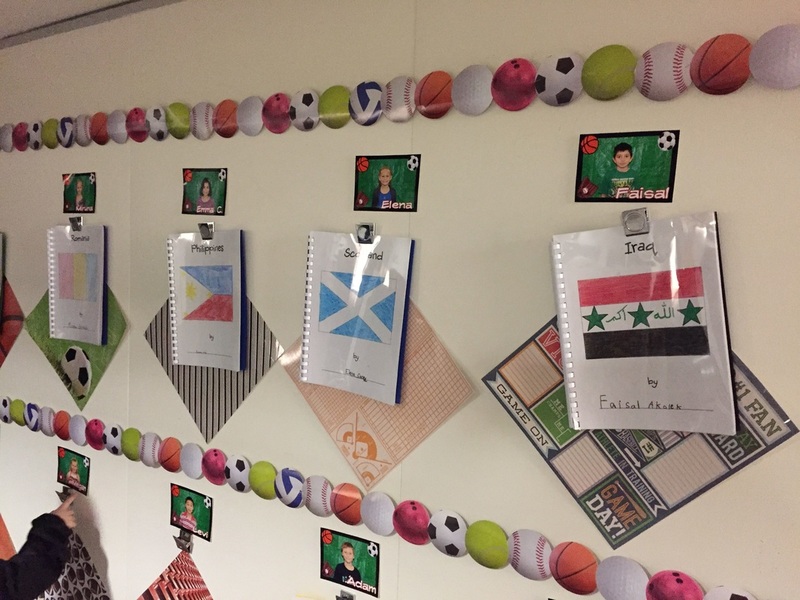 At our spring open house, we decorated our room to reflect our sports theme and showed class movies with students acting as Sports Center reporters. 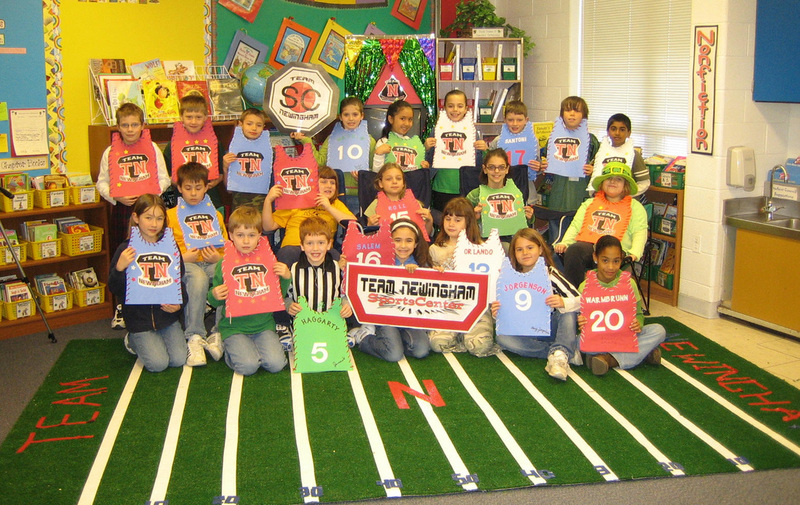 For a spring open house we had while doing a sports theme, we created a football field using turf carpet and duct tape. 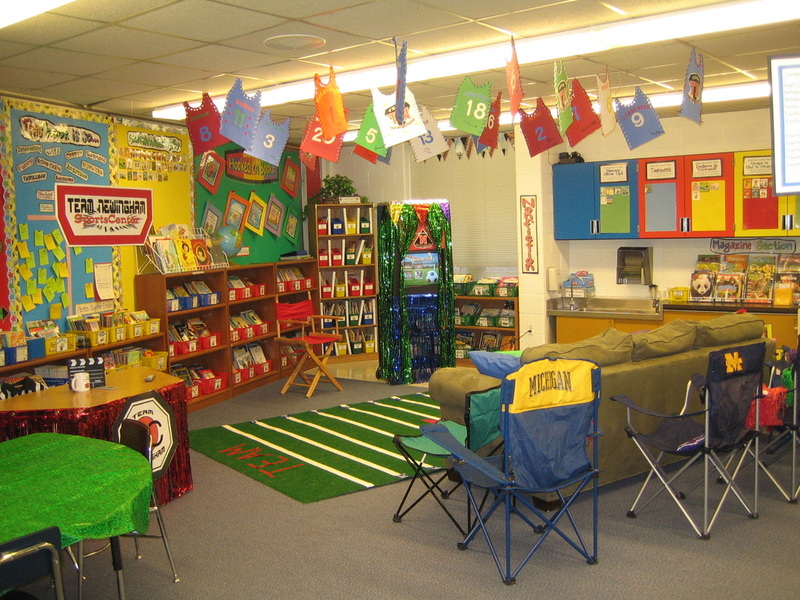 We created a viewing area for our class movies (which were shown on a TV back then)! 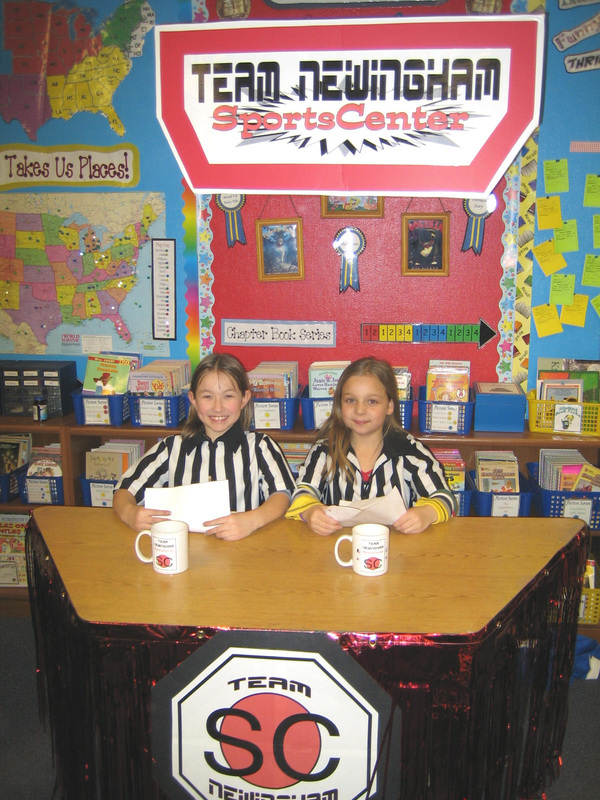 Students even put together SportsCenter updates to introduce our class movies at the open house! Students signed autographed baseball cards and made lists of their favorite things for guests to see when they visited our classroom. 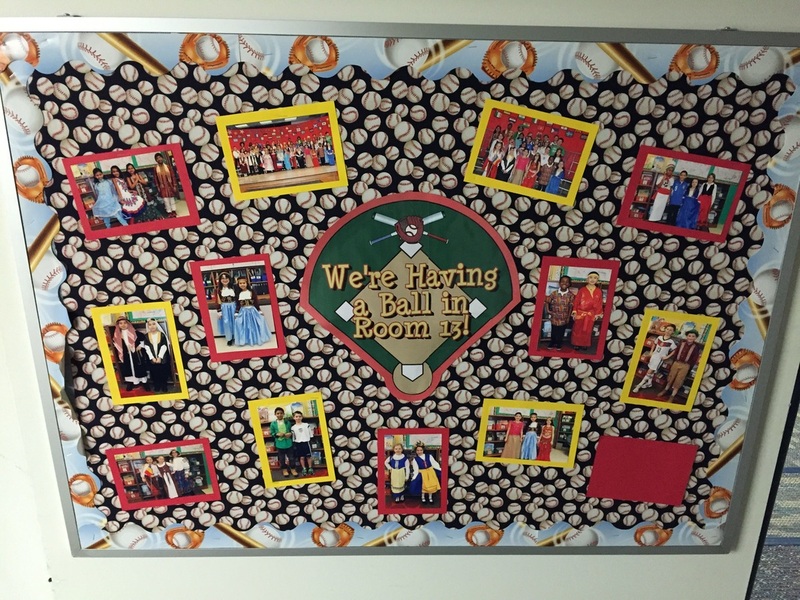 This bulletin board is in the hallway outside our classroom. 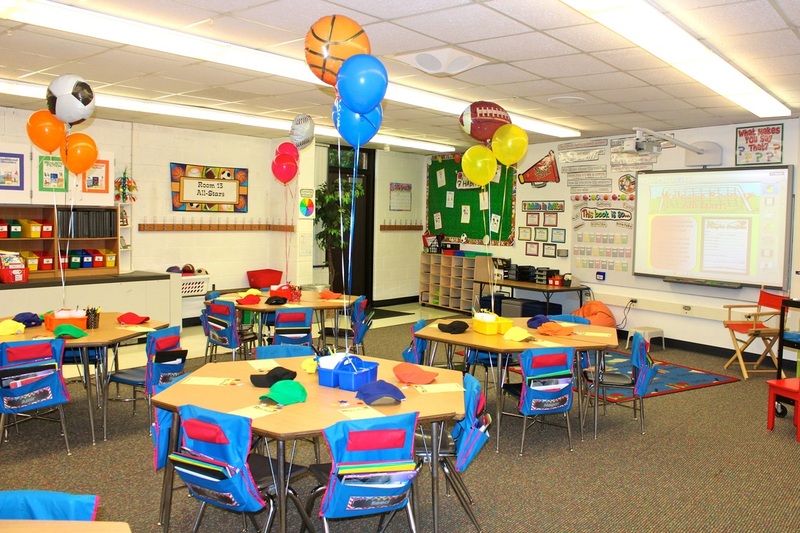 I change the photos as often as possible to show what we are doing in Room 13! 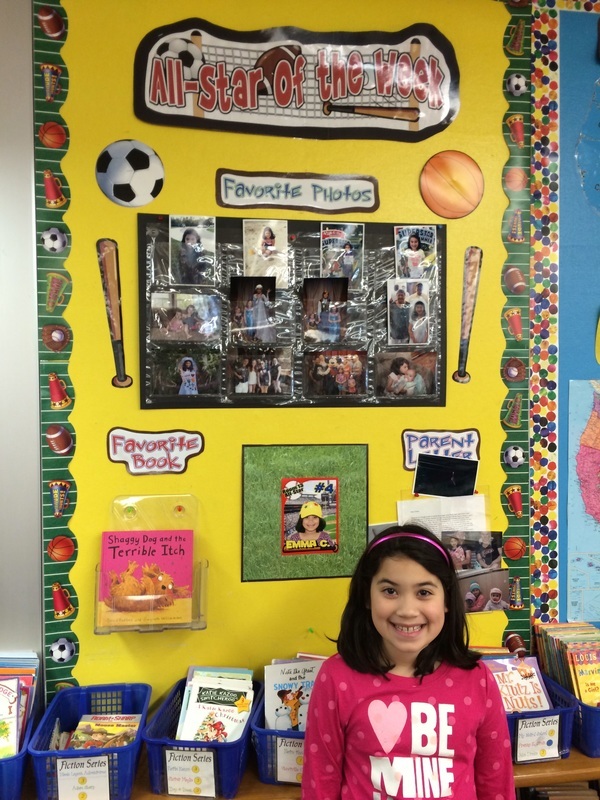 Our student of the week is called the "All-Star of the Week" and gets to decorate this bulletin board with photos and other special things their classmates will enjoy. 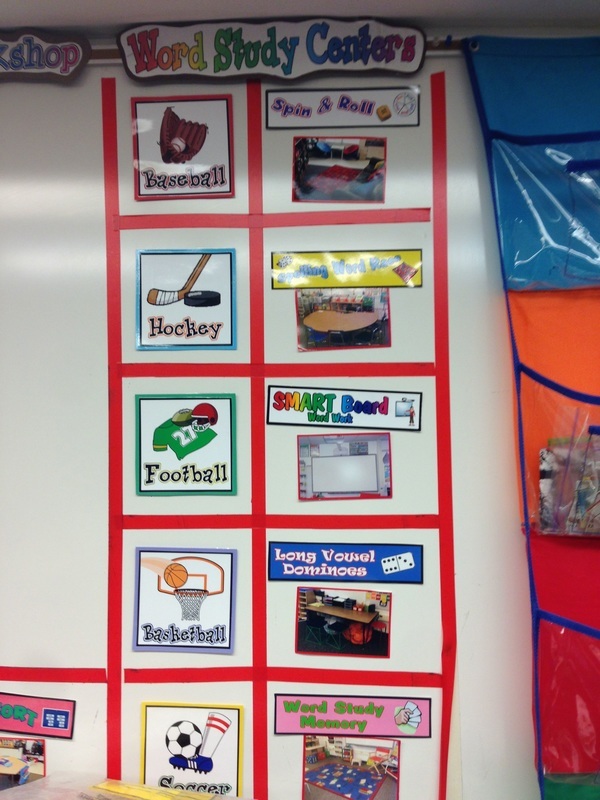 My word study center rotation groups are named after popular sports. 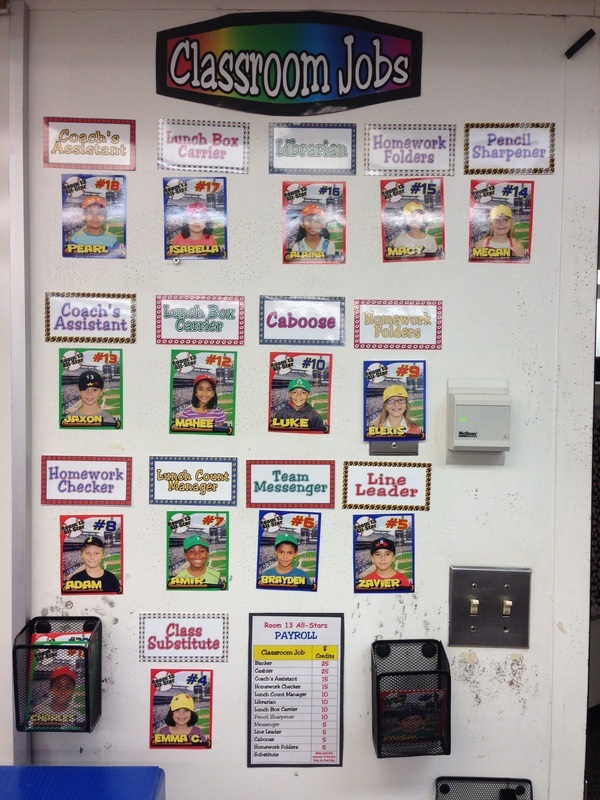 Students' baseball cards are used to rotate through our classroom jobs each week. 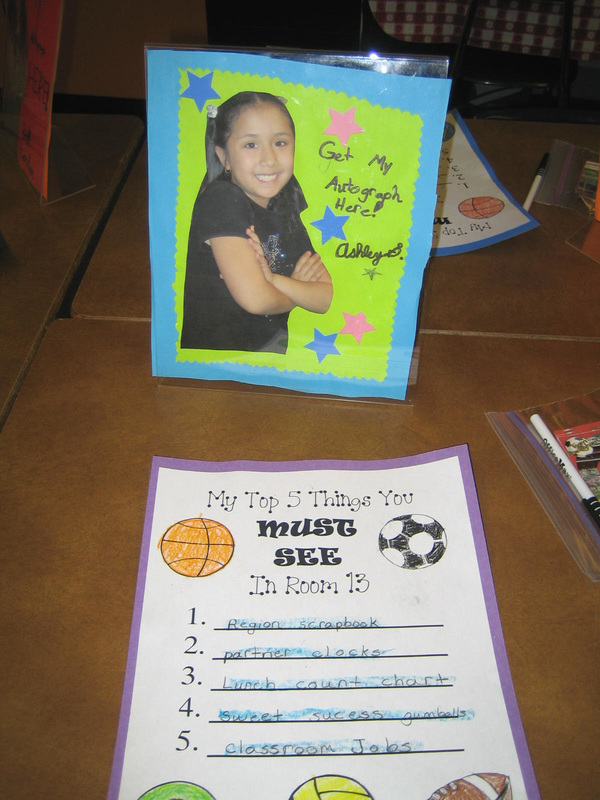 Large 12x12 sports-themed scrapbook pages are laminated and used to decorate our "All-Star Work" display in the hallway. The work changes every month, but the sports backgrounds stay the same. 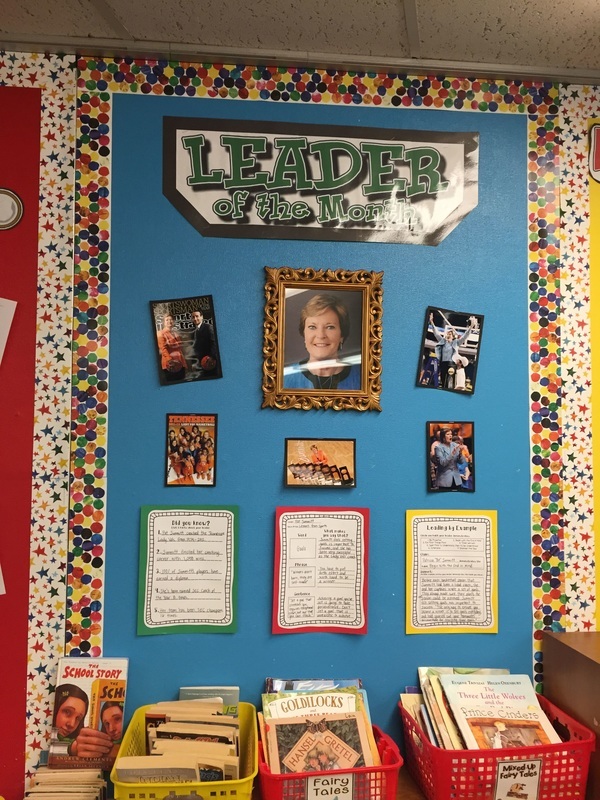 We focused on inspirational men and women in sports throughout the school year for our "Leader of the Month" board.